Does Your Coffee Hide A Secret? Did you know one of the most important issues about coffee is unknown by many coffee shop enthusiasts? What you pour in your morning coffee cup affects our backyard birds, tropical widlife, coffee growers, and the lives of children. Best of all, the kind thing to do also gets you a great tasting cup of coffee! Before the 1960s, most coffee grew slowly on shaded hillsides. But when industry focus switched from quality to low cost, many canned brands began blending in cheaper, more bitter beans. To compete, many high quality coffee bean growers responded by clear-cutting the trees on their shaded farms to grow beans faster in full sun. The result was a sacrifice in flavor – but that was just the start. Those trees provided homes for migratory birds. As avid birders can tell you, U.S. bird populations are in decline. Estimates created from Christmas Bird Counts and the Breeding Bird Survey show about a 50% decline in popular neotropical migratory species like painted buntings, bobolinks, and western meadowlarks, while notables like loggerhead shrikes and cerulean warblers have plummeted even further. And it’s not just birds getting the short end of the branch. Birds and other wildlife on traditional shade farms ate crop pests. Fallen leaves from the trees provided natural mulch and fertilizer. Trees also gave farmers additional crops and a fuel source from annual pruning. Without these benefits, farmers had to buy pesticide, fertilizer, and fuel. Low prices and added expenses meant families often couldn't send children to school, but needed them picking coffee. With their short arms, children's faces rub against the sprayed leaves sometimes causing the chemicals to burn their skin. These chemicals then run off into the waterways. Here’s the good news. As Americans, we drink about a third of the world’s coffee. Armed with this knowledge, our purchasing choices can help reverse the trend begun decades ago and shift how coffee is grown in a positive way. 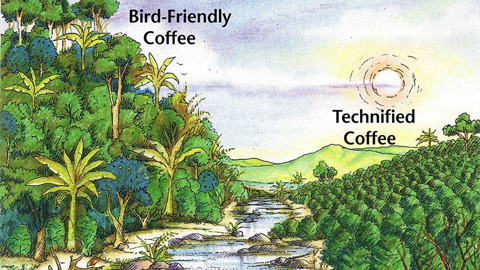 To address all these issues, look and ask for bird-friendly® coffee as certified by the Smithsonian Migratory Bird Center. This science-based system certifies farms that provide real homes for birds and inspections are carried out by agencies accredited by USDA's National Organic Program to guarantee the quality. And the premium they can sell the coffee for benefits the growers and their families. Please read certifications carefully. Some popular labels like Rainforest Alliance only guarantee that a minimum of 30% of the product meets the standard you think you're buying. And generic references to shade or traditional farms are not a guarantee of anything. The Bird-Friendly® certification guarantees 100% meets the standards - and that means you're truly supporting the farmers taking care of the land and its wild inhabitants. Wynn's at the Zoo serves certified Bird-Friendly® coffee. Enjoy some on your next visit! Then ask for it where you buy coffee by the cup or bag and be sure it's the certified Bird Friendly® and not a generic shade-grown claim. You can also order online from these suppliers and you can usually find one to three certified options at Whole Foods Market®. Many of our staff drink the Early Bird Blend coffee from Allegro in the mornings and at meetings. Sip the solution for a better tomorrow for people and wildlife!